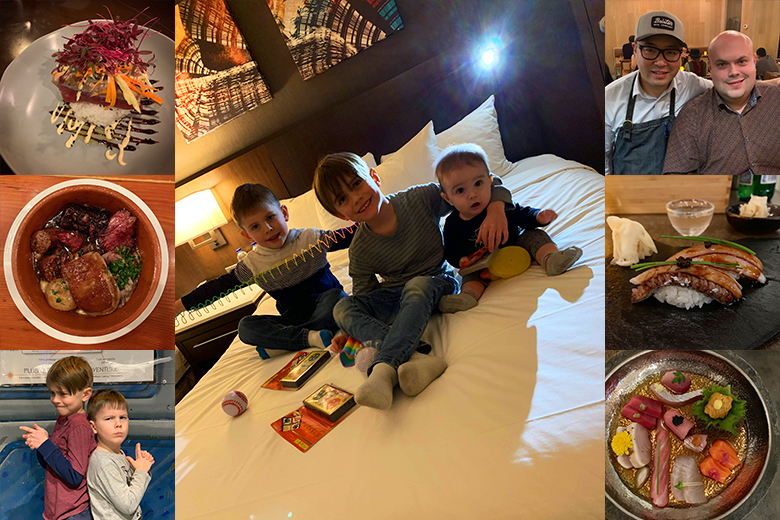 Home Blog	ROAD TRIPPIN’: Winter Activities in Montréal with the Family … And Great Food of Course! ROAD TRIPPIN’: Winter Activities in Montréal with the Family … And Great Food of Course! Although most of my travel revolves around food, my wife and boys love to travel just as much as I do. Montréal is quite often our destination of choice with the kids due to its proximity to Ottawa/Gatineau. Not to mention that our boys absolutely love staying in hotels – especially when the amenities include a pool! There was no doubt in our mind that staying near the Quartier des Spectacles would be a great location for us. We booked the Delta Hotels Montréal by Marriott for many reasons. Great location, trusted brand, close to some of our winter activities, great amenities and of course, our favourite, a club lounge. Club lounges most often offer 24-hour access to coffee, water, soft drinks and snacks but also welcome guests for breakfast and evening hors-d’oeuvres. So, depending on your travel patterns and your daily schedule, upgrade could result in a cost savings by reducing the number of meals you have to eat at a restaurant. We headed for Montréal Friday afternoon when I was done work. Upon checking-in, it was obvious that the staff at the Delta were on point and work hard to ensure guest experience. The boys were given little welcome bags with gifts and the baby was given a baby welcome bag as well. When we arrived at our room, we were welcomed with a tray of wonderful treats. Some wine and a cheese plate for the adults and some cookies with glasses of milk for the boys. It’s always special when welcome gifts are tailored to each of the guests – including the kids. We headed down to the 2nd floor of the hotel to dine at the hands of Executive Chef Ron Kneabone. Le Cordial Resto-Bar offers a French fusion menu along with a kid’s menu that is sure to please the little ones. I started dinner off with one of my favourite cocktails an old fashioned. When it came time to ordering, the kids chose pizza and poutine which were generous in size and kid approved! My wife ordered the Caeser Salad and the One Pound Poutine, I ordered the Tuna Poke and Slow Cooked Veal Ribs. The poke was not your classic presentation but rather included a tuna steak seared on one side on a sushi rice patty. Drizzled with some sweet sauce, this dish was delicious! The slow cooked veal ribs were fall-off-the-bone tender and the mushroom sauce was rich and luscious. With dinner nestled nicely in our bellies, we grabbed a sneak peek at the pool, some hot chocolate from the lounge and headed back to our room. But before turning in for the night, Rafael and I took a short walk to check out and try out this year’s installation of Luminothérapie entitled, Domino Effect. The 9th edition delivers a fun and entertaining experience that brings people together and fosters a spirit of cooperation. Domino Effect consists of 120 dominos brightly coloured and distributed across several stations in different ways, creating a wide range of sound and lighting effects. Rafael absolutely loved it and despite the polar vortex that was moving in over Montréal, the cold didn’t hinder us from playing for a good 45 minutes. We headed back and slept the night away. In the morning we hopped-over to the Club Lounge where we enjoyed a great breakfast and lattes over looking the frozen city of Montréal. The mercury had fallen to a freezing -30 celsius and windchill upwards of -37 celsius, our outdoor schedule of activities had to be tweaked. On the agenda were BARBEGAZI, Voiles en Voiles and La Grande Roue. But before heading into the cold, we jumped into the pool and hot tub so the kids would kick their day off just the way they like it. We hopped on the metro and headed to BARBEGAZI at the Esplanade Financière Sun Life at the Olympic Park. The kids enjoyed watching the axe throwing, snowboarding and roasting marshmallows of course. Despite the bitter cold the boys wanted to try the tree toss game and had a lot of fun. They downed a hot waffle in the registration tent and off we went towards Montréal’s Old Port. The bitter cold and blowing winds were rendering the activities at the Old Port unbearable. It was decided that we would take to those activities on Sunday before heading home. During the day I had exchanged a few text messages with my friend Chef Antonio Park, and, since he was in town, I knew I would be opting for a light dinner so I could swing by later in the evening when the family went to bed. The snow had started to fall, with a major snowfall warning in the forecast, the beauty of the old cobblestone streets as the sun went down was just beautiful. We stopped by the Vieux-Port Steakhouse to grab a bite before heading back to the hotel. The kids dove into the table bread and shared a shrimp cocktail and an order of calamari. My wife ordered the Mac & Cheese with Bacon and Ham – it was fantastic! I ordered the Foie Gras Torchon with Maple Jelly, Pistachios and Walnut Croutons. Love torchon. We gobbled up our food and headed back to the hotel. Some hot chocolate and cookies before bed from the lounge, bath and then a movie in bed for boys. With everyone tucked in, it was time for me to head out to Park. The snow storm hit Montréal hard – it was blistery cold and whiteout conditions everywhere. As I arrived, I was greeted at the door and brought to my seat near the sushi bar. Antonio swung by to chat and told me I was going to enjoy a great meal tonight. At this point Antonio was behind the sushi bar helping his team when he ran me a Chutoro Hand-Roll. It was delicious! Round 6 – Sashimi Plate featuring Toro, Chutoro, Akami, Albacore, BC Uni, Salmon, Snapper. What a night! It was great seeing Chef again and as always, I look forward to my next visit! The ride back to the hotel was a disaster and had me questioning about our return home the next day. As we woke up Sunday morning, the city was enveloped in mountains of snow. Accidents and road closures all over the map. Having promised the boys we would go to Laser Quest, I kept my word as we hopped in a taxi and made our way over. The real question is – what is the City of Montréal going to do with all of this snow! The kids were ecstatic to find out that they would be joining a large group from a birthday party, meaning there would be lots of players around their age. We took in a couple games and visited the arcade corner where we shot some hoops, raced some cars and played some air hockey. This is always a highlight for the boys when we are in town. We took an Uber back to the hotel and at this point we decided that it was too dangerous to head home in these kinds of conditions – so we extended our stay at the Delta for another night! Activities were being cancelled everywhere and our plan to attend La Fête des Neiges was called off. We were hoping to head out at some point during the day to La Grande Roue but it was closed due to the severe weather conditions. We spent the day at the pool, in the lounge and enjoyed pizza delivery for dinner. As we were turning in the for the night, I exchanged some text messages with some of my Chef friends at Au Pied de Cochon. I’ve known Chef Michael Picard, nephew of the famed owner Chef Martin Picard, and Chef Antoine Morneau for many years. They wanted me to swing by – twist my arm! The kids were asleep and my wife was feeding the baby so I got ready and headed over. This Montréal staple is the richest and best tasting food anywhere. The menu screams of French-Canadian decadence. I started my meal off with a pint of the house Blonde and then it all began. Round 1 – Cromesquis – Breaded cubes of Foie Gras that explode in your mouth! Round 3 – Potée du PDC – House Blood Sausage, House Ham, House Sausage, Pork Tenderloin, Cheesy Mashed Potatoes and I chose to add some seared Foie Gras. Round 4 – Pouding Chomeur – For good measure my friends added some old cheddar and salt-cured foie gras on top! That was it – no more room for anything – even moving was an issue. These guys know how to put you into a food coma! Back to the hotel and now it was time to try and sleep after all of this food. On Monday morning, we woke up, grabbed some breakfast in the lounge and started the trek home. The roads were still slippery and snow-packed but we made it home safely. Despite missing out on some of our main plans, we got to enjoy some wonderful family time, great food and a little holiday.